When I lived in Massachusetts and people ask me why I love running, my answer included a lot of different things. Most importantly, running was time to myself. In undergrad, I worked anywhere between 3 and 5 jobs at a time, maintained straight As through a tough schedule of hard sciences (organic chemsitry, anyone? How about two semesters?? ), and made it a point to spend time with my friends on the weekends. Every second of every day was planned out, and most of them were spent completing assignments, going to class, and working for someone else. Don’t get me wrong, I loved it. I loved the challenge of having so much going on, and I made sure that I succeeded every time. It was a particular brand of satisfaction that I miss now that I’m out of school, but it didn’t come without stress. Running gave me some time to relax, to work towards a goal that was imposed by nobody but myself, and to think. 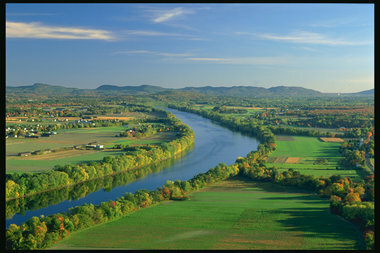 Through running, I came to truly fall in love with Western Mass, where I grew up and went to college. There were many moments that I was running along through fields in Hadley under the Holyoke Range and I was overcome with something that I believe could be described as bliss: “Man, I am so lucky to live here and be healthy enough to do this. There is no place in the world that I would rather be.” I can’t tell you how many times I was having trouble organizing my thoughts for a paper, and would go out for a run and it wrote itself in my mind. I always gained clarity on tough situations with my college boyfriend when I took a few miles to work it out on the roads. Nobody could talk to me, nobody could demand that I finish my papers or cover someone’s pilates class; and I never felt guilty about taking that time for myself. Look familiar? Tell me you don’t want to run here. Now that I’m back on my feet in NOLA, I have been much happier but my feelings towards running are totally different. Now, big chunks of my time are taken up by rotations and work, but I don’t have things hanging over my head. I don’t feel a sense of accomplishment in any of these endeavors, and I don’t have a lot of friends other than my fellow interns (who are AWESOME but let’s be real I could use a bit more testosterone in my group of friends). So, running has morphed to fill these needs. You see, when you run in the city your options are: 1.) run alone in the park in circles 2.) run alone on the streetcar line in circles 3.) run alone in neighborhoods that you are 100% positive are okay…in circles. Basically, it gets really repetitive. With a group, there is more freedom to do big loops of the city and not worry about the questionable areas as much. Also, I really have no idea where the hell I am going in New Orleans. Perhaps the biggest perk, however, is the camaraderie. At home, I was the girl that ran. I didn’t know what I was doing, but I went out and I loved it and that was enough. Now the runs are not nearly as beautiful, and having someone there to chat with helps a lot. Especially when that someone happens to know what they’re doing. The people I have been running with all know a LOT more than I do about pretty much every aspect of running (except maybe nutrition), and I get to pick their brains for free. Just for hangin out. Now, I’m back home for Christmas in Western Mass, land of hills and farms and solitude. It’s beautiful but I’m not used to it anymore. So, I was totally freaking out about my scheduled 16-miler yesterday: a hilly loop with a 655-foot elevation gain on windy country roads. When I woke up to a wind advisory and snow flurries, my nerves got a little bit worse. But I bundled up, went out there, and did it. And you know what? I fell in love all over again. It has been so long since I have been able to enjoy nature, and it caught me so off guard that as I turned a corner into a small valley with a bird sanctuary on one side, old farmhouses surrounded with a low rock wall on the other and hills in the distance, tears came to my eyes. I am so lucky. Moral of the story? Running will be what you need it to be. Run with people. Run alone. But whatever you do, keep on running. You’ll be glad you did. This entry was posted in Life Lessons, Running and tagged nature, run group, thoughts, varsity sports, western massachusetts. Bookmark the permalink.